You must have seen one of the many Hollywood films where a gaggle of plucky underdogs is coached through certain failure only to finally (surprise!) win the day. Or you maybe you’ve watched one of the TV lifestyle documentaries like Faking It, Supernanny or Property Ladder that stick just as rigidly to the formula — in the third quarter hour the host will look on in despair as the protagonist demonstrates their utter hopelessness only to show that, after the adverts (surprise!) they can overcome the insurmountable odds to perform their new skill, control their awful children or temper their taste in interior decoration and sell a house. We began running through Lilia Litviak: Fighter Ace last Sunday and this was the third quarter hour of our show. At least, I’m hoping it was only the third, and that we still have another fifteen minutes in which to turn things around. Having only worked on each scene individually we expected the first run-throughs to be tough, but we didn’t expect them to be that bad. In a whole day of rehearsal we didn’t even manage to run through the entire play once. I think the fundamental reason for this is because we’re doing this in our spare time, which has a couple of effects. First, we can’t do, say, three solid weeks of rehearsal — it’s been spread out over a few months of days here and there. So when we came to run through scenes we’d last worked on several weeks earlier everyone’s memories of them were different, despite Michael’s detailed notes. 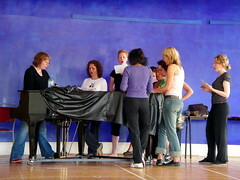 The second effect is that people have often been missing from rehearsals. If you’ve got 15 or so people working on something over a few months it’s tough to get them all in the same place at the same time consistently, particularly over the summer. So, last Sunday, some people were dealing with scenes for the very first time. Add on all the problems to which we’d optimistically said “oh, we’ll deal with that little detail in the run throughs,” and we had to do way too much creation, rather than consolidation, during Sunday’s long, slow run-through which we only finished at the next session on Thursday evening. After that we went through it again, just managing to get it finished, this time in 1¾ hours — much longer than we want the final piece to be, and it was still a clunky and painful procedure, but a big improvement. Today we continued, and while I was despairing at times, wondering what I’d invited my friends to come and see, the final attempt came in at a decent pace and even seemed to run smoothly. It’s wonderful to see everything flow together at last and I’m hoping the emotion of events is finally showing through the mechanics of the choreography. Although my usual pessimistic self is still there it seems entirely possible that the final part of this script will adhere to the formula and the plucky underdogs will, hopefully, pull it off.